Scroll, browse - enjoy our art, nature and other inspiration ! Pearls give us the sleeker version - we call them Coco Chains. Elegant, understated, feminine and strict at the same time. With stone beads resembling tempting colourful berries we make the Berry Chains. We like to say colour is is good for you; like fruit and berries, have five a day! Pastel pearls from Swarovski are standard for our signature design ​Coco Chains. These pearls are fake and fabulous! Three different sizes and several colour options make Coco Chains ideal for bespoke collections. Colourful stone beads give you Berry Chains. 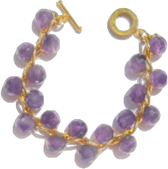 Our wearable berries are made with semi precious stones. We prefer un-dyed stones that are colourful enough in their natural state. 15 stone choices available. We're also in the business of smile and delight! Our hands are happy when we make these bracelets and we are still thrilled at their simplicity. No dangles, no fuss; just solidly there to enhance our outfits and delight our eyes. And we love the smile they bring out when someone tries them on. We smile when we've finished a bracelet and it looks so good we want to wear it, right away. We enjoy the delighted smile of someone discovering their bracelet turns necklace. We are all for happy surprices, and we love bringing them on. Our bracelets are a little bit different - and we like to think - quite delightful. 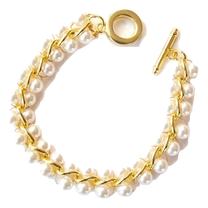 ​We create chain bracelets adorned with pastel pearls and colourful stone beads. • We believe in SLOW DESIGN and are warm supporters of handmade. • We create collections or unika and happily co-create with industry or private customers. • Inspired by creative customers we constantly develop new versions of beads & chain. ​• We like to work with people and businesses who share our values. We love making bracelets - they add colour to the wrist and please our eyes all day! With our additional neck chains any bracelet turns into a necklace​ - Lego for ladies! "Us and we" - refers to myself, Tittin, and an adhoc team of invaluable helpers and advicers. All our bracelets are made to order. That goes for both collections and unika design, so we keep no stock. Are you a business? What about a bespoke bracelet collection developed to your spesifications? Looking for a single signature design for your shop, label, or a launch? We'll design one with you. Working together is more fun and creates better result. Adding Colour to the Wrist - Pleasing the Eye - Enjoying the Process. Big, small, business or private customer? We don't really care - as long as you smile and like your work! CAN WE TEMPT YOU? - SEND US A WORD! ​Red and pink - for purpose and passion! We like to think we've covered all possible questions but there's always something that slips through. For a good collaboration it helps to know each other. A few points: Our background is design focused. ​Grey Pearl prototypes are skillfully hand-made, but not by goldsmiths. ​Tittin Rinde. All rights reserved.